Soya mince is often used as a substitute for ground beef. 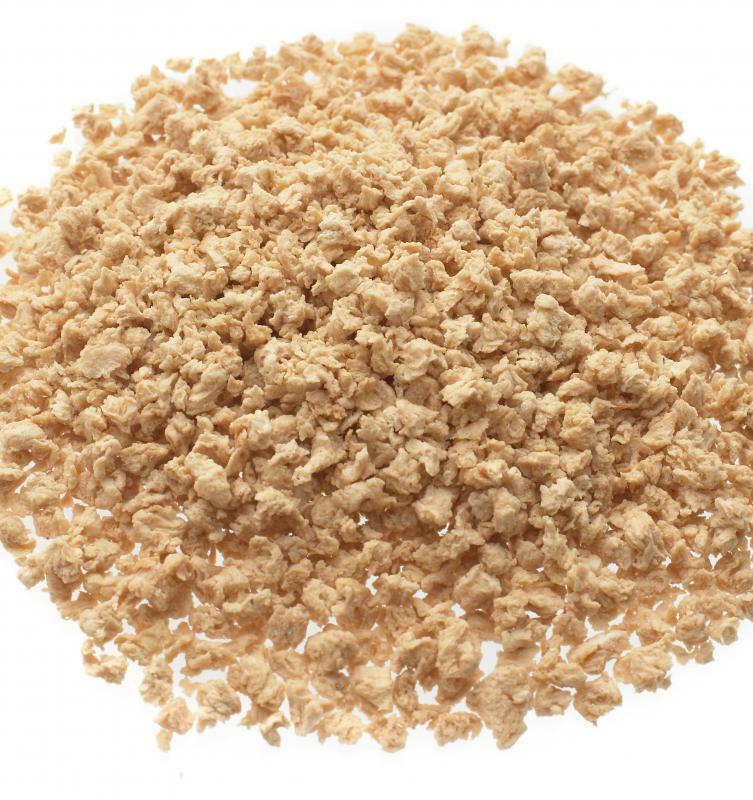 Vegetarian meat crumbles are made of textured vegetable protein. 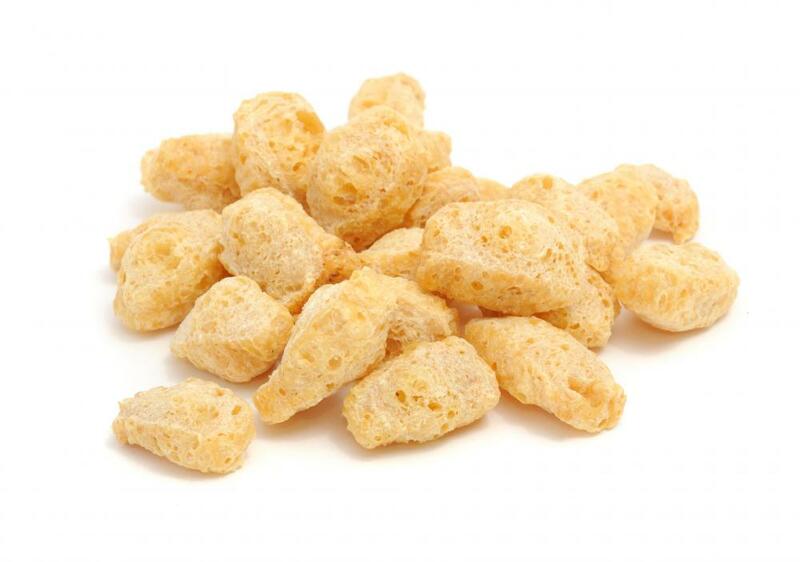 Vegetarian beef is another name for the soybean-based vegan substitute known as textured vegetable protein (TVP). Several companies manufacture TVP to mirror the textures and flavors of beef, but without the beef part. A variety of cuts are available — from ground beef for burgers or taco filling to sirloin-style strips for dishes like fajitas. The process of making vegetarian beef involves removing soybean oil from the beans to produce a flour. This substance is then pressurized, heated and crafted into a variety of forms. Herbs, spices and hydrolizing ingredients are often added for thickening and binding, in addition to simulating a meaty or smoky flavor. The result, though clearly different than meat in flavor and texture, is a protein-packed addition to many diets, vegetarian or otherwise. Its fat and amino acid content is high, but so is its level of fiber. On average, TVP's lipid, or fat, content is equal to its fiber content — both about 15 percent. Some of the more prevalent brands of vegetable beef products in 2011 are Morningside, Boca Burger, Garden™ Protein, Lightlife and Yves. Most grocery stores carry at least a few brands of TVP, while health food stores are more apt to carry a larger variety. These products could be packaged as meatballs, beef crumbles, salisbury steaks, meatloafs, roasts or even sandwich-ready slices. When the fat in vegetarian beef goes through a process called hydrolization and the container is sealed tightly, this food's shelf life could extend beyond a year. In pure form, it does not even need to be in the freezer, though many finished vegetarian beef products are sold in the freezer section. The reason for this is that these products may also contain foods like mushrooms or other vegetables and spices that must be frozen to avoid rotting. Aside from its use in traditional meals, such as crumbled for taco filling or squeezed into sausages, vegetarian beef is utilized by chefs in as many ways as the real beef it tries to mimic. From beef stews to vegetarian chile, this artificial meat is used to add a savory and filling aspect to many meals. This element of vegetarian beef, along with its cousin tofu, helps many vegetarians and vegans thrive in their chosen lifestyle by providing a sufficient source of protein and fat, while also allowing them enjoy a meaty flavor in meals that otherwise may seem bland. What Are the Different Types of Ground Beef Stew? What Is Vegan Ground Beef? What Are Kobe Beef Burgers?